Also in 2007, special events, including Pirate Takeover, Haunted Halloween and Disney’s Sparkling Christmas, brought brand new experiences to guests, featuring adventurous, eerie and romantic themes throughout the year. In 2008, the park continues to expand with exciting new attractions and entertainment offerings, including the iconic “it’s a small world”, High School Musical: LIVE!, an outdoor musical show based on the hugely popular “High School Musical” films, Muppet Mobile Lab and Turtle Talk with Crush. Another entertainment offering, The Art of Animation, will also launch in 2008. Guests enter Hong Kong Disneyland through Main Street, U.S.A., designed after quintessential small-town America and evoking a time gone by when the gas lamps were giving way to electricity and the “horseless carriage” was the latest novelty. Its nostalgic design transports guests from the real world into a magic kingdom, where they can then venture into several exciting lands. The spectacular Sleeping Beauty Castle is the gateway to Fantasyland. Here, guests can find a magical place where their favorite Disney stories come alive. They can take to the air in Dumbo the Flying Elephant, take a boat ride in the whimsical “it’s a small world”, take a spin in the Mad Hatter Tea Cups or meet beloved Disney characters such as Winnie the Pooh, Snow White and Mickey Mouse himself. 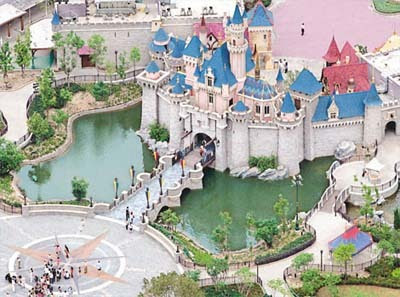 The centerpiece of Fantasyland is a one-of-a-kind attraction, Fantasy Gardens, which is unique to Hong Kong Disneyland. In Adventureland, guests begin a journey into the exotic regions of the Asian and African jungles. Adventureland showcases some of the most spectacular trees and plant life ever assembled in one place. Here guests can take a daring ride on the Jungle River Cruise and explore many other attractions, including a whole island devoted to Tarzan. Adventureland also includes one of the largest indoor theaters in Hong Kong: the Theater in the Wild home to the Broadway-style entertainment spectacular Festival of the Lion King. Tomorrowland is a world filled with science fiction and soaring space adventures. Taking a whole new approach to Tomorrowland, different from that of any other Disney park, Disney’s Imagineers have created an entire land that becomes an Intergalactic Spaceport every restaurant, shop and attraction is filled with robots, rocket ships and floating planets. In Tomorrowland, guests are treated to the warp-speed adventure of Space Mountain; they can blast enemy targets with Buzz Lightyear Astro Blasters, and they can climb aboard their own flying saucer in the Orbitron. the interactive Stitch Encounter, the driving attraction Autopia and the water oasis UFO Zone. 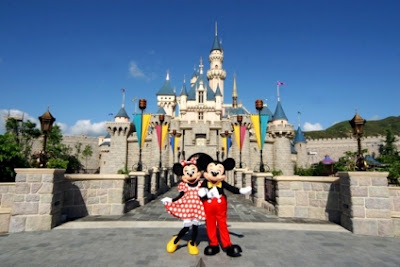 The Hong Kong Disneyland Resort brings the magic of Disney to families across Asia. As the first Disney theme park in China, Hong Kong Disneyland inspires guests as they enter a world of imagination, fantasy and adventure. The park brings together the best rides, shows and attractions from Disney parks around the world as well as exciting new experiences offered only at Hong Kong Disneyland to create a Disney theme park like no other. 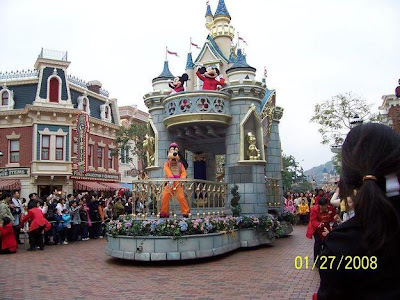 Since the resort opened on September 12, 2005, with a spectacular, three-day celebration, Hong Kong Disneyland has continued to expand with exciting new entertainment offerings and attractions. In 2006, the expansion of Tomorrowland brought three new attractions to the park the interactive Stitch Encounter, which allows guests to speak directly to the energetic blue alien; a “real-life” driving experience, Autopia, which features sleek, electricconvertibles cruising along an out-of-this-world landscape; and UFO Zone, a fun-filled water oasis. During the summer of 2007, Hong Kong Disneyland introduced the Animation Academy, teaching guests to draw their favorite Disney characters from the latest generation of talented Disney artists, and Mickey’s WaterWorks Parade, a water-based day parade designed uniquely for Hong Kong Disneyland. Guests can expect Mickey and his pals to deliver a “splashy” show featuring Goofy dutifully watering the plants and Minnie carefully spritzing her flowers. Hong Kong Wetland Park of the Agriculture, Fisheries and Conservation Department has organised a four-month “World Wetlands Day 2010 Hong Kong Celebration Programme” from October 2009 to February 2010. Over 200 activities was organised, which reached over 7,000 participants. 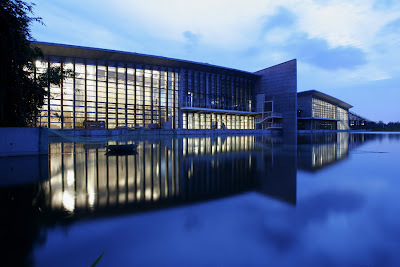 The theme of “World Wetlands Day 2010 Hong Kong Celebration Programme” was “Wetland, Biodiversity, Climate Change”. 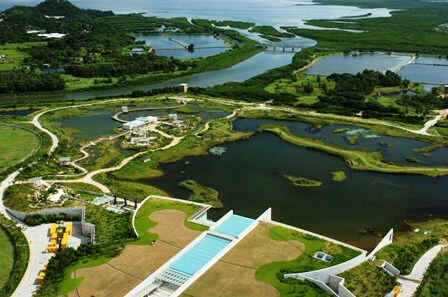 Hong Kong Wetland Park made use of the slogan “Caring for Wetlands – an answer to Climate Change ” to organise a series of educational and promotional activities to match with Ramsar Convention’s “Communication, Education, Participation and Awareness (CEPA)” programme to promote the sustainable use of wetland resources. Next to the Mai Po Inner Deep Bay Ramsar Site, the Hong Kong Wetland Park is one of the important stopover points for migratory waterbirds. Every year, many migratory birds stay in Hong Kong from October to the next March, making it the best period for bird watching. To date, the Park has recorded over 230 bird species, which is about 50% of Hong Kong bird species recorded. 60% of the bird species recorded in HKWP are migrants and 11 species are globally threatened, including Black-faced Spoonbill and Baikal Teal. 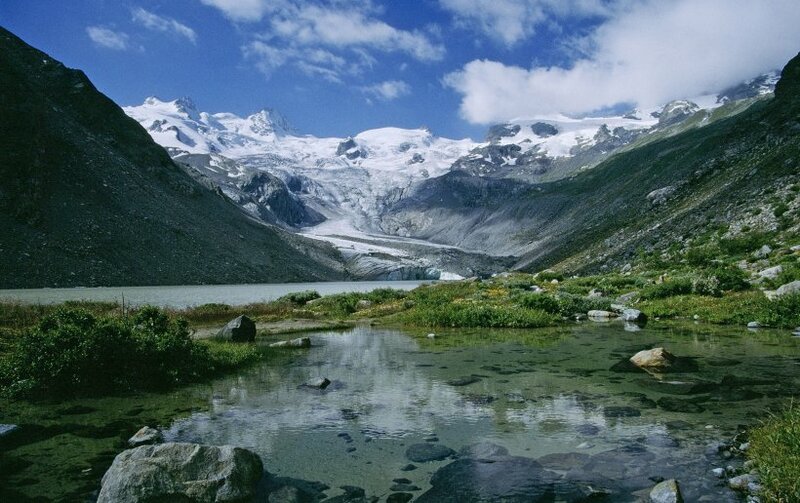 The Park is also famous for freshwater specialists such as Greater Painted-snipe and Water-pheasant. Birds are regarded as bio-indicator to the environment, and bird records have been widely used to show the effect of climate change. To encourage more people to observe these beautiful birds and to promote monitoring of the environment as well as relevant impact by climate change, Hong Kong Wetland Park organised the "Bird Watching Festival" to echo with the WWD theme from 17 October 2009 to 28 February 2010. "World Wetlands Day 2010 - Bird Watching Festival" was divided into three major categories, including Public Participation, Environmental Studies and Interactive Wetlands. Education workshop for teachers on mangrove ecology. - Photography with the "Wetland Animal Star"
Hong Kong Island is divided into four main areas Kowloon, Hong Kong Island, the New Territories and the Outlying Islands. Kowloon and the New Territories are on a peninsula of the Chinese mainland, on the northern side of Victoria Harbour; Hong Kong Island is on the southern side of the harbour facing Kowloon; the Outlying Islands simply refers to any of the other 234 islands. The New Territories has a 20km (12mi) land border with China proper. The city itself is centred around Victoria Harbour. The main business district is Central, on Hong Kong Island. East of Central lies the Admiralty commercial district; Wan Chai, known for restaurants and clubs; then Causeway Bay, a major shopping area. Towering above it all is the Peak, Hong Kong’s premier scenic outlook and residential district, which happily has plenty of public green space. In Kowloon, Tsim Sha Tsui (on the southern tip), Jordan and Yau Ma Tei are busy hotel and shopping areas, while Mong Kok is a bustling residential and shopping area. 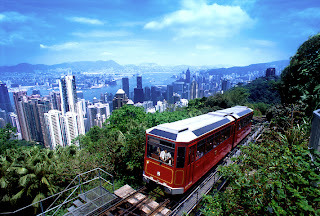 The Peak is Hong Kong Island’s highest point, and the most fashionable area to live in Hong Kong. The view from the summit is one of the most spectacular cityscapes in the world, and it’s also a good way to get a visual perspective of Hong Kong. The best way up to the Peak is via the Peak Tram. Hong Kong city of jade during the day, it becomes a luminous pearl with a sea of lights twinkling in the streets after dark. 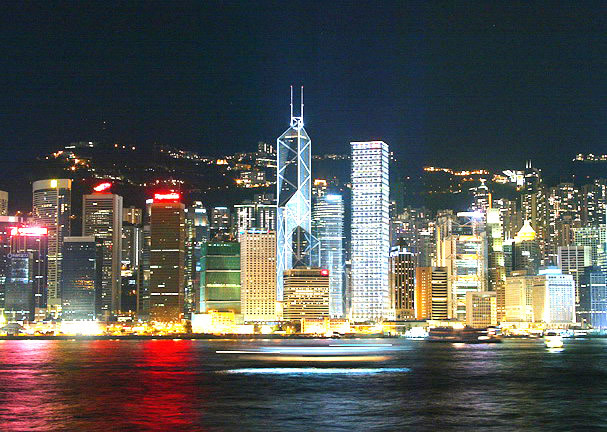 Where is the best place to enjoy the multi-colorful night scene that encompasses Hong Kong and Victoria Harbor? Victoria Peak is a good location to view its night scene. Being 554 meters (about 1,817.6 feet) above sea level, Victoria Peak is the highest point within Hong Kong and occupies the western part of the island. * if you like to walk, you can exit Central's MTR Station from Exit J2, walk along Garden Road which is in between The Bank of China building and The Cheung Kong Centre. The walk to the tram station only takes about 15 to 20 minutes. Peak Tower is the goal of the tourists on the Victoria Peak. The skyscrapers, when looked from the Tower, seem jutting out of the earth. Designed by the British architect Terry Farrell, Peak Tower has seven floors, with a viewing platform on the third floor. Ripley's Believe It or Not is a franchise dealing in extraordinary events and items which might seem unbelievable to the readers. The odditorium has more than 450 bizarre exhibits collected from all over the world. The first computer-operated entertainment ride in Hong Kong is a journey through scenes of the Hong Kong's early history. It is something that young and old would love to watch together. A branch of world-renowned Madame Tussaud's Wax Museum of London is situated on Peak Tower. The museum has wax idols of famous people from history and contemporary personalities exhibited in lifelike poses. Located on the fourth floor, Peak Explorer Motion Simulator is equipped with high-tech projectors, sound system and motion chairs. When one looks at the images on screen, one gets an illusion of actually being there. 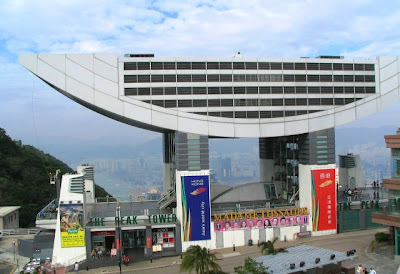 Peak Tower holds several gift shops selling Chinese arts and crafts, books, cosmetics and other souvenirs. It also has a a popular Park'n'Shop supermarket for area residents. More shops dealing in various articles have been added to Peak Tower recently. Exquisite bird life has made the Park more attractive. Most prominent among the bird residents of Victoria Peak is the Black Kite. Fascinating array of butterflies also live there. Thanks to its natural face, the Peak Tower play an important role in the social life of locals. If offers number of park benches that are used by the locals to pass their free time. Victoria Peak has several restaurants which take care of the dining needs of the visitors. Prominent eateries on the tower include Peak Lookout, Kyo Hachi, Bubba Gum, Pearl on the Peak, Burger King, Eating Plus and Tien Yi. also available from the terminal. Lamma Island the original name of the island Pok Liu. The island is shaped like two Y in opposite direction. When the British first came to the island, they used the colloquial pronunciation of Nam Ah, i.e. "Lam Ah (Lamma)" as the name of the island. The Chinese names of East Lamma Channel and West Lamma Channel are still formed from Pok Liu instead of Nam A. Another folk etymology says the name came from a former lamaist monastery on the island. Lamma Island was named after the shape of the island which looks like the limb of a tree, and Naam meaning "south". Lamma thus means literally "southern Y". The name can also mean "Southern Peninsula Island". Located about half an hour by ferry from bustling downtown Hong Kong, Lamma is an eclectic melting-pot of arty culture and Chinese tradition. Due to its proximity to town, it is one of the most adored weekend getaways. Clean air, golden beaches, delicious seafood and fantastic hiking are the main draws. The Lamma island is Hong Kong's third largest being about 6km in length and quite narrow being about 2.5kms at its widest point. Apart from a large power station built in 1972 on the western side of the island which supplies energy to Hong Kong Island and a recent solitary wind turbine the island is virtually unspoiled and something of a contrast to its outlying island neighbours Cheung Chau and Peng Chau. It has a population of around 5,000 of which the vast majority live in the two main villages, Yung Shue Wan and Sok Kwu Wan. Lamma in Chinese means "the southern tree branch" and Lamma Island was originally known as "Bok Liu Chau". The island is very rural with some rugged scenery with granite hills dominated by the 353 metre peak of Mount Stenhouse (Shan Tei Tong) in the south, as well as tiny settlements and quiet beaches. Lantau Island primarily consists of mountainous terrain. With an area of approx. 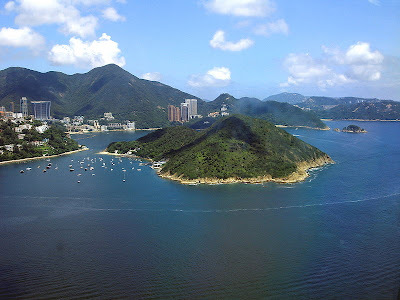 146 km², it is the largest island in Hong Kong, and is almost twice the size of Hong Kong Island. Lantau Peak (934 m) is the highest point of the island. 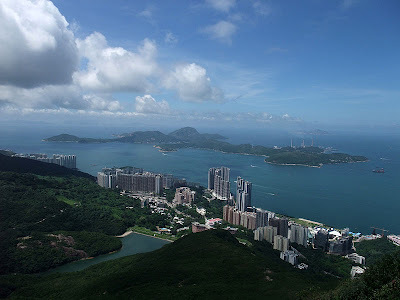 It is the second highest in Hong Kong, after Tai Mo Shan, and is almost twice the height of Victoria Peak. Lantau Island is often referred to as "the lungs of Hong Kong", because of its abundance of indigenous forest and relative scarcity of high-rise residential developments which characterise Hong Kong Island and Kowloon. Lantau Island, based on the old local name of Lantau Peak is the largest island in Hong Kong, located at the mouth of the Pearl River. 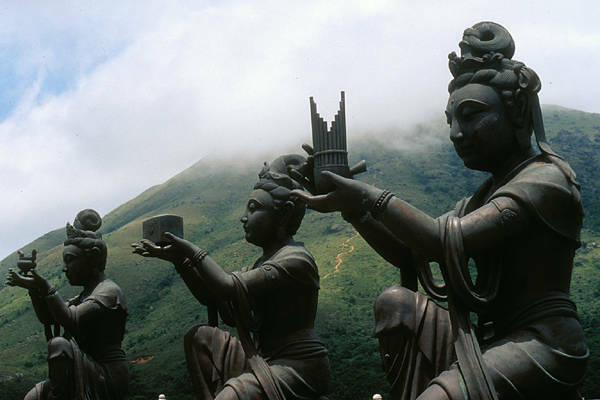 Administratively, most of Lantau Island is in the Islands District of Hong Kong. A small northeastern portion of the island is located in the Tsuen Wan District. With a land mass of 147.16 square kilometres (56.82 sq mi), it is the largest island in Hong Kong and the sixth largest island in China. Originally the site of fishing villages. There are 47 villages on Lantau Island. Three of them, Mui Wo, Tai O, and Tung Chung are being developed as new towns. In addition, more than 78.4 square kilometers (30.3 square miles) of the island has been designated as Wild Countryside Park. 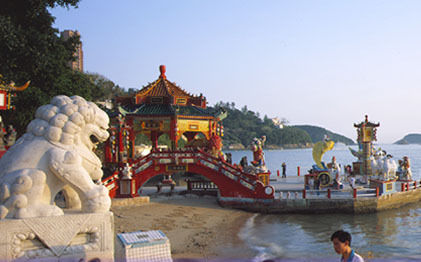 Tai O, also known as "The Venice of the Orient", is the largest settlement on Lantau Island. Crisscrossing canals run the length and breadth of the small fishing harbor. In addition, homes built on stilts over the water are a common sight here. Tai O was once a garrison town but has now become a peaceful fishing harbor. Salted fish is a local specialty. Tai O was once the largest city on the island. In the 1970s, Tai O started to attract holiday visitors, and today the town is prosperous and busy. 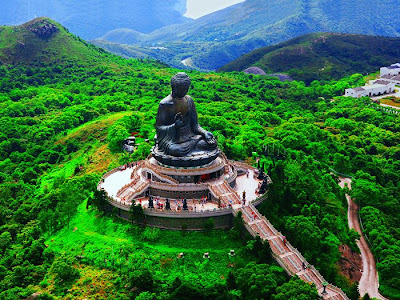 The tours include a visit to Ngong Ping 360, Hong Kong's spectacular tourism attraction that features a stunning 5.7-km cable car ride up a mountainside on Ngong Ping 360. The 25-minute journey offers breath-taking panoramic views encompassing the airport, South China Sea, lush mountains and valleys, and the awe-inspiring Giant Buddha statue. The cable car takes you to the culturally themed Ngong Ping Village, which incorporates three major attractions: Walking with Buddha, Monkey's Tale Theatre and the Ngong Ping Tea House, along with a diverse array of eateries and shops. On Ngong Ping Plateau, where the Tian Tan Buddha (or “Giant Buddha”), an 85-foot-high bronze Buddha statue, various monastery buildings and a vegetarian restaurant can be found. 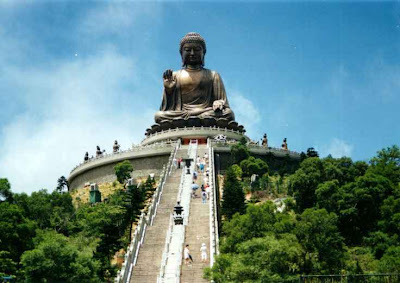 Walkers can ascend from Tung Chung to the monastery in two hours. Visitors can also take a 25 minutes ride on Ngong Ping Cable Car from Tung Chung to Ngong Ping Plateau. Ngong Ping 360 is a dynamic new tourism experience, which combines a stunning 5.7km cable car journey with an impressive cultural themed village and easy access to the Tian Tan Buddha Statue, the world’s largest, seated, outdoor, bronze Buddha statue. Will get to know some of the Asia's most precious native animals like giant pandas, red pandas, Chinese giant salamanders and Chinese alligators. Admire the spectacular display of goldfish at the 'Goldfish Treasures' exhibit. Visit the colourful birds and playful Asian small-clawed otters at the 'Panda Village'. Atoll Reef is shaped like a three or four storied elliptical fishbowl. Tourist can view a variety of fish through six centimeters (about 2.4 inches) glass windows. Atoll Reef is divided into the shadow and the deep levels each exhibiting its characteristic aquatic life. The collection includes sharks, tropical fish and nautilus. Visitors will see morays, groupers, turtles and over 400 kinds of maritime animals from the Pacific Islands or the South China Sea. trip starts from the middle Kingdom neighboring the Tai Shue Wan Entrance. At the middle Kingdom, tourists will see many ancient structures such as temples, pavilions and streets. Walking through the middle Kingdom, you come upon the Hong Kong Jockey Giant Panda Habitat, home to two lovely pandas, Anan the male, and Jiajia the female. Both are very popular and appear contented in their lush green environs. Tourists enjoy watching them eat and sleep. Hongkong Ocean Park include Theater is the most famous and popular spot in the whole Ocean Park. It is an open-air theater in which dolphins and sea lions stage a wonderful performance in a huge pond. Under the guidance of trainers, adorable dolphins and sea lions stand in a line or jump into water and raise theirs heads out of water. Ocean Park Hong Kong Your or tourist Can taking the cable-car, visitors ascend to the headland section. From the cable-car, you will have an unparalleled spectacular view of Hong Kong Island and the sublime South China Sea beyond. From here you can see the expanse of the marvelous maritime landscape comprised of Atoll Reef, Shark Aquarium, Ocean Theater, Ocean Park Tower and among others. 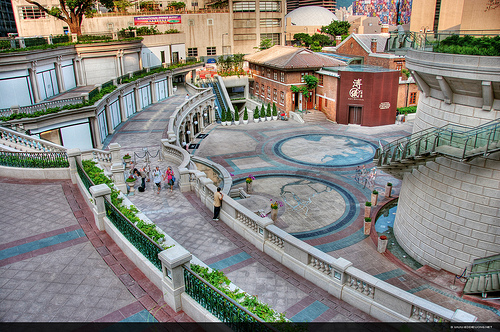 Ocean Park is located on the southern side of Hong Kong Island, covering more than 870,000 square metres of land. There are three attraction areas, which are the Lowland, the Headland and Tai Shue Wan. The three areas are connected by a cable car, outdoor escalator which is the second longest in the world and Ocean Express. Repulse Bay is a nice area with lots of apartments, houses, and beaches. The main apartment building in Repulse Bay is The Repulse Bay. This building is known by its big hole in the middle. The beach was extended artificially, and thus the sand closer to the shore is coarser than that further away. Until the early 1960s, residential buildings were quite restricted. Three blocks of six storey apartments were developed by Dr. P. P. Chiu and his brother P. W. Chiu, part way up the mountain overlooking Repulse Bay. These were luxury apartments with servants' quarters, with only two apartments per floor in Blocks A and B. Apartments in Block C are smaller. For a long time, these were the only apartments allowed on the mountain. The Repulse Bay Tower was rebuilt on the site of the Repulse Bay Hotel. Now, it's a building for residence. In its front is the Repulse Bay Shopping Plaza. In it, many restaurants and shops can be found. The Repulse Bay beach stretches long with clear azure blue water gently lapping the seashore. Its sand is golden and soft. With water temperatures ranging from 16ºC (60.8ºF) to 26ºC (80.6ºF) year round, it is a mecca for locals and visitors alike to escape the heat. Repulse Bay beach has become one of Hong Kong’s most popular beaches because it is close to the city on Hong Kong Island and because it is relatively clean, cozy, has good public facilities like bathrooms and showers and is south facing. Tourist on the beach can face the water and the sun, and the sun reflects off the glittering water and waves. Tourist can walk to the nearby restaurants and get refreshments and swim out into the small bay that is watched by lifeguards during the regular season. The temperatures are perfect in the summer for basking in the sun and enjoying playing. 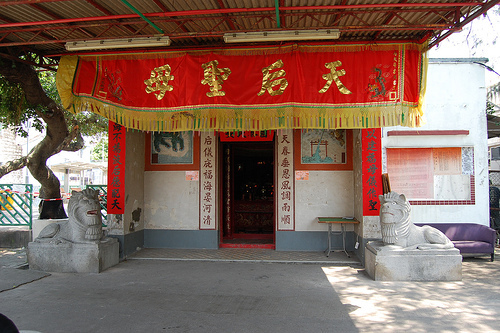 Yung Shue Wan Tin Hau Temple and Sok Kwu Wan are the two villages in Lamma with ferry connections either from Central or Aberdeen. Go to Pier 4 at the Central waterfront. The trip takes about 30 minutes. Generally, visitors go to Yung Shue Wan rst. After arriving, one suggestion is to walk the whole length of Main St. You will nally reach the end where the Tin Hau Temple and North Lamma Clinic are located. Along the way, take note of the myriad of restaurants and eateries. The Main St. is also lined with interesting souvenir shops. 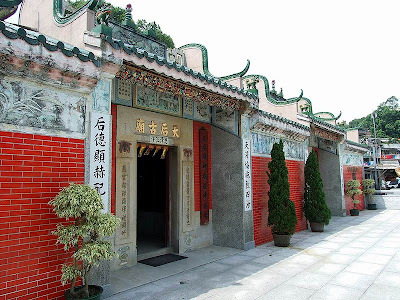 Tin Hau or Goddess of The Sea was born in 960 A.D. during the Sung Dynasty. The imperial court dei ed her because of her power in protecting seafarers. Legend said that she saved her family member during a storm. Through the course of history, she was also credited with many life saving deeds. She is called Matsu in Taiwan and in Macau. In her temple, there are usually two erce looking gures by her side. One is Guard of Thousand Mile Vision and the other Guard of Tail Wind Ear who can listen from afar. The Yung Shue Wan Tin Hau Temple is at the end of Main St. One interesting story is about the pair of stone lions at the front of the temple, which actually resembles in style the bronze pair at HK & Shanghai Banking Corp. headquarter building in Central. During the 1965 renovation when the lions had to be replaced, traditional Chinese style lions were not available from China because of the Cultural Revolution. So, a local artisan, who once carved Western style lions for the rich in South East Asia, was given the job. 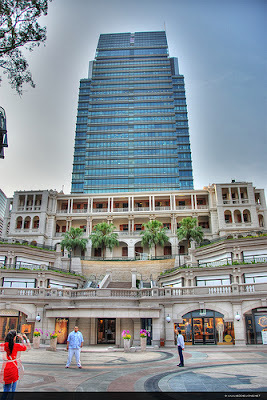 1881 Heritage, an adaptive re-use project owned and developed by Cheung Kong (Holdings) Limited (“Cheung Kong”), recently won three awards at the prestigious Asia Pacific Property Awards 2010. The annual property industry competition has a geographic footprint of 19 regions in the Asia-Pacific area. 1881 Heritage is the first private sector adaptive re-use project of its kind in Hong Kong. 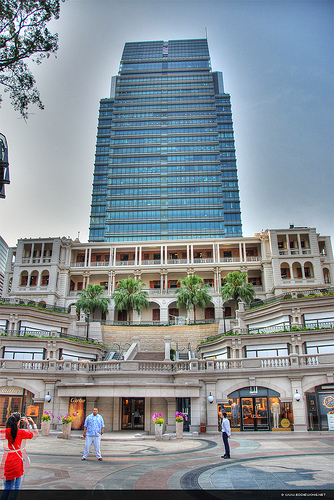 With its unique architectural features and historical background, the development has been transformed into a new cultural and shopping landmark in Hong Kong, and is now being recognized by the international property community. The original site of 1881 Heritage was the Hong Kong Marine Police Headquarters of which construction commenced in 1881. 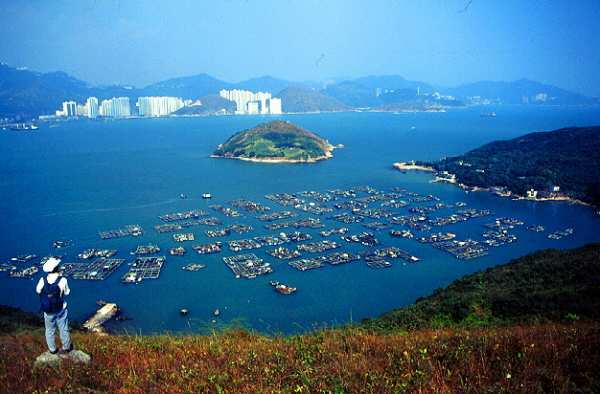 Cheung Kong was awarded the redevelopment tender in 2003 and spent over HK$1 billion on the project. The revitalization project, which took over six years to complete, was carried out in accordance with world conservation standards. The overriding objective of the revitalization was to preserve the original look and features while adding new functionalities to suit modern needs. An example of this was the making use of an old bomb shelter to build a passageway leading to the new Heritage Hall. The original buildings on site including the Main Building, the Stable Block and the Time Ball Tower, all of which were declared historical monuments, were preserved. Furthermore, new additions in Victorian architectural style were constructed. After winning the Asia Pacific Best Redevelopment Award, 1881 Heritage will now run against the five-star winners in the same category in other regions of the world for the title of “World’s Best Redevelopment”. The accolade reflects the recognition of Cheung Kong’s conservation and revitalization efforts by the regional and international property industry. At the same award ceremony, 1881 Heritage also received the five-star Best Mixed Use Development Award for its balanced usage of the site in conservation, commerce, leisure and education. A Heritage Hall has been set up in 1881 Heritage to display a collection of relics which are representative of the history of the place. Free guided tours of the site are also conducted regularly. At the same time, 1881 Heritage offers 13,000 sq. ft. of luxury boutiques, fine dining establishments and a heritage hotel. The shopping amenities include many of the leading international brands in jewellery, watches, designer fashion and giftware. A number of these prestigious brands have chosen 1881 Heritage as the address for their flagship shops. The boutique hotel, Hullett House, boasts luxury themed suites, and five restaurants and bars, all of which pay tribute to the rich legacy and colourful past of Hong Kong. Cheung Kong’s revitalization work has successfully given the historical compound back to society and allows Hong Kong people as well as overseas visitors to get acquainted with Hong Kong’s history while enjoying the shopping and leisure facilities. Apart from the restoration project of 1881 Heritage, Cheung Kong has introduced a host of new design concepts for residential properties, office buildings, shopping centres, industrial properties and hotels. These concepts involve the layout of developments, the arrangement of units and the selection of interior materials. 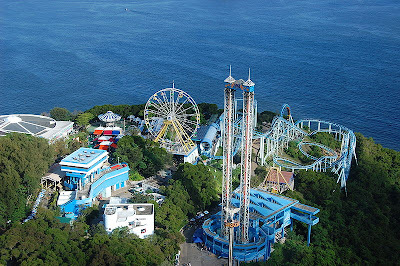 Examples can be seen in Celestial Heights at Ho Man Tin, The Capitol at LOHAS Park and The Legend at Jardine’s Lookout. To accentuate the upmarket positioning of the development, all residential towers in Celestial Heights are connected by a private road named Celestial Avenue. The development features a European-style garden of about 100,000 sq. ft., a banquet hall inspired by the Louvre in France, a 55-metre swimming pool with fountains and a clubhouse decorated with crystal chandeliers and marble. LOHAS Park is the largest green community in the urban area of Hong Kong. The planning of the development promotes the concepts of environmental protection and healthy lifestyle. The arrangement of the residential towers is similar to that of organ pipes, which lets in natural light and ensures adequate ventilation. The residential units are divided into left and right wings in five different towers with three elevators serving four units per floor to increase the privacy enjoyed by the residents. The Legend is the first residential development that adopts fibre optics in its design, utilizing over 19,000 metres of optical fibres. The roof of the development is reminiscent of an eagle spreading its wings. The project is a landmark in the traditional luxury residential area of eastern Mid-levels.